Organization is key for the aficionados of crockery, records, cameras, and ceramics featured in the pages of Dwell. To prevent their growing collections from mushrooming into a chaotic mess, they found creative ways to showcase their prized possessions—from shelves built into staircases to a DIY pegboard to simple perches for pottery. 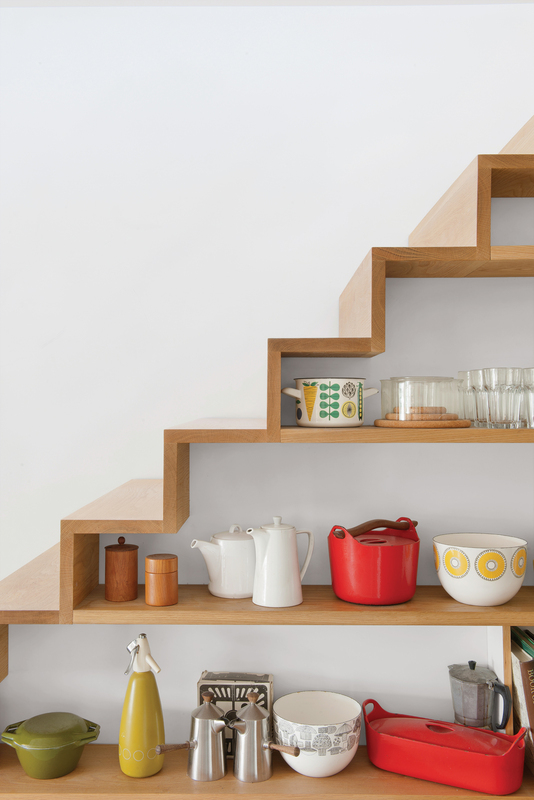 A closer look at the shelving built into the staircase in the kitchen. Typographer Erik Spiekermann's Berlin abode boasts a two-story bookshelf accessed via a mountaineer's harness, a sleek stainless steel kitchen, and modern furniture. But his collection of vintage Leica cameras is what won us over. Designer Lisa Congdon's San Francisco house is filled with vintage crockery, all hand-selected. Here, a fleet of plates adds a bit of eye candy to the white walls. Kenneth Montague's Toronto house is filled with an enviable array of contemporary art, photography, sculpture, and furniture. And one of the most comprehensive collections of salt and pepper shakers. "I’ve got valuable paintings and historic photos next to tear-outs from magazines. These things all together tell stories and reflect my passion about black culture and about modernism," he says. Two coats of black chalkboard paint transform a simple pegboard into a display piece for a series of wooden spoons. “I love the contrast of the warm golden woods against the black,” says designer Margaret Oomen. Scandinavian pottery adorns the living room in Bob Weinstein’s New York City live/work loft. Hunderds of records are neatly stowed away in the renovated Los Angeles residence of Ramona Trent and Anthony Pearson. Instead of art, designer Susanna Vento displays a colorful medly of postcards and magazine tearouts on the walls of her modern Finnish apartment—inexpensive and easy to swap out. A closer look at the shelving built into the staircase in the kitchen. Photo by Andrew Meredith. Image courtesy of Andrew Meredith 2007.